South America Sheet V Patagonia. This is a fine example of the 1838 Society for the Diffusion of Useful Knowledge or S.D.U.K. 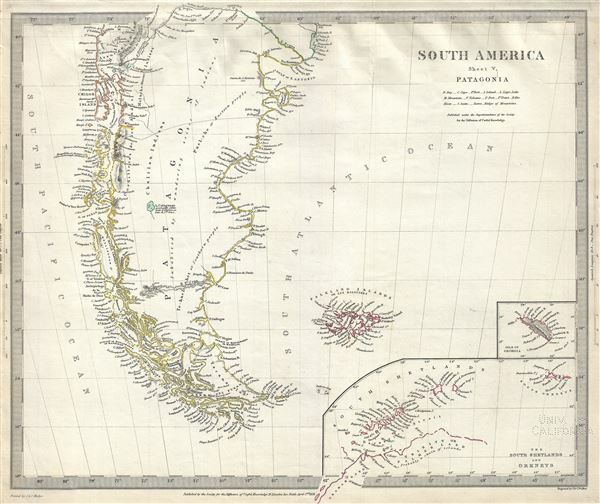 map of Patagonia or modern day Argentina and Chile, including the Falkland Islands and Tierra del Fuego. Towns, rivers, mountains, lakes and other topographical features are noted. Much of the interiors were unexplored at the time. The interiors, which were largely unexplored at the time, identify several indigenous tribes including the Chulilau Indians the Te-huel-het or Southern people, the Puel-che or Eastern people. The central region is identified as 'inhabited by wandering tribes of Indians.' Two insets in the lower right quadrant depict the South Shetland or Orkneys and the Isle of Georgia. This map was originally copyrighted in 1838, but was issued in Volume two of Chapman and Hall's 1844 edition of Maps of the Society for the Diffusion of Useful Knowledge. It was engraved by John Walker of J. and C. Walker. Rumsey 0890.152. Phillips (Atlases) 794.